Back in November 2002 we ran a picture by Tony Richards, taken in the English Lake District valley of Great Langdale, with Loft Crag radiant in a shaft of sunlight. A blog visitor from Las Vegas was enchanted: in the town of make believe come true, among the glitter, lights, and glamor the simple, natural beauty shone forth. No wonder someone once called Lakeland the 'Roots of Heaven', well before the 1956 Romain Gary novel, or the 1958 John Huston movie from the book. Interestingly, Sir Malcolm Arnold's overture music for the film appears on an ASV CD alongside Maurice Johnstone's 'Tarn Hows - a Cumbrian Rhapsody': Tarn Hows is just over the hill to the south of Great Langdale. 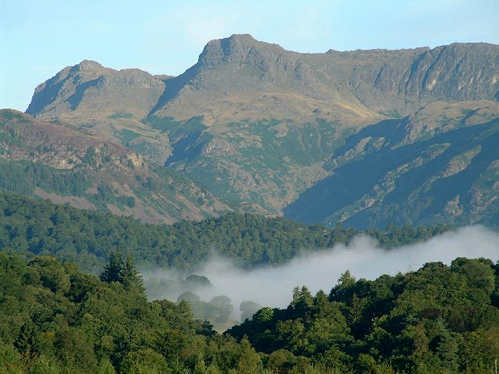 Today we feature another Tony Richards shot from Skelwith Fold (just south east of Skelwith Bridge on the map links in the header for this item), with a misty valley floor and the Langdale Pikes at the head of the valley rising clear above. Those with larger monitors may enjoy a larger version of the picture. American actor (1960- ). A man whose career survived a bumpy marriage to an even more famous and overwhelming personality. His brooding, dark performances sometimes translated into real life displays of bad temper, often aimed at the paparazzi . He is credited with saying, "I was brought up in a country that relished fear-based religion, corrupt government, and an entire white population living on stolen property that they murdered for and that is passed on from generation to generation." This entry was prepared using an IMDB (Internet Movie Database) feature. - John Ruskin (1819-1900), British art critic, author. Letter, June 18, 1877. 1920 - The 19th Amendment to the Constitution, guaranteeing women the right to vote, was ratified by Tennessee, giving it the two-thirds majority (36 states) of state ratification necessary to make it law. It was another forty three years before James Meredith became the first African-American to graduate from the University of Mississippi on this day in 1963. Clearly achieving equality of any sort is a long uphill struggle against discrimination. Click on the thumbnails to popup larger versions of the images. LakelandCAM.co.uk web site and took this picture. This is one of the classic views of the area, which boasts the English record for the smallest church, the highest mountain, the deepest lake, and the biggest liar, Wil Ritson, along with those who come after him in the annual competition. If you have a larger monitor there is a slightly larger version of the picture (please allow time for it to download). Wasdale is also home to Jos Naylor the 'King of the Fells' (the local word for mountains), and Tony stopped for a chat. There is a recent item on Jos in the archives. It still blows me away that a man with no cartilage in his knees runs up and down mountains for fun. Nice to see that at the usual maximum retirement age, Jos seems to have no plans to slow down.